This 52 year old female patient was diagnosed with HIV infection in May 2007. At that time her CD4 cell count was 401cells/ul. After one year her CD4 cell count had dropped to 162cells/ul and she was initiated on d4T/3TC/EFV. In April 2011 she was seen by the medical officer with symptoms consistent with symptomatic hyperlactataemia. The regimen was switched to TDF/3TC/EFV. On review now she reports financial insecurity to the extent that she has struggled to attend clinic for adherence sessions. She had been referred to the home-based care team but stated that they were not useful because they did not give her any pills. The patient viral load never fully suppressed to less than 25 RNA copies/ml in more than three years of ART. Her CD4 count also never responded to ART. It continued on a downward trend even after ART initiation. The patient has resistance to all of the four ARVs that she has been exposed to. The NNRTI mutations K103N, V106M, E138A and M230L confer high-level resistance to efavirenz (EFV) and nevirapine (NVP). 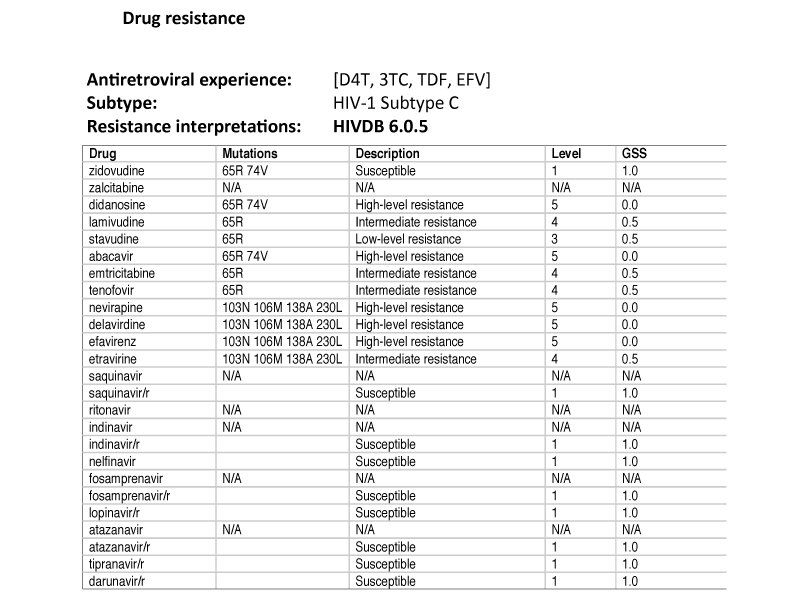 She further has intermediate resistance to lamivudine (3TC) and tenofovir (TDF) as well as as low level resistance to stavudine (d4T) secondary to the NRTI/NtRTI mutations K65R and L74V. The treatment switch from d4T to TDF was made approximately 1 year after the VL was almost suppressed for the first time after 1.5 years on treatment. In light of the previous elevated VLs, the clinician should have a high index of treatment failure in this patient. It should be noted that a single drug substitution should never be made when there are concerns about treatment failure, as resistance might develop very quickly if the VL is not suppressed at the time. Unfortunately, this patient did develop the K65R mutation and she can therefore not use TDF again. Before TDF is however discontinued, she should be tested for hepatitis B. If she tests positive, she should continue on TDF and will then be on a 4-drug regimen. In light of the hyperlactataemia, d4T and ddI are not acceptable options. The only viable options for this patient is to use either AZT or ABC together with 3TC and LPV/r. AZT is in line with the South African national guidelines, AZT/3TC/LPV/r would have an acceptable GSS of 2.5 and is therefore the preferred treatment option. If the patient has active hepatitis B infection, she should continue with TDF and thus be on a four-drug regimen consisting of AZT, TDF, 3TC and LPV/r. Intensified adherence counseling is needed and all attempts should be made to address barriers to adherence that might have contributed to first-line failure. I. Was it appropriate to switch d4T to TDF at the time of symptomatic hyperlactataemia? II. After three months of her new ART regimen her Hb has dropped from 11.7g/dL to 5.6g/dL. What will you do now? I. No. It is always best to confirm that the VL is suppressed before a single drug substitution is made. If this is not possible i.e. ART needs to be stopped immediately as in cases of lactic acidosis, then the best strategy is to stop all the drugs but cover the tail of EFV with LPV/r for 2 weeks. II. This anaemia is almost certainly caused by AZT. Since the Hb is less than 6, AZT should be stopped and replaced with the only alternative, namely ABC. Remember to first do the VL to ensure that it is suppressed before a treatment switch is made!